It is still cool and rainy here in Seattle. Memorial Day usually inspires outdoor grilling, however, the rain never stopped yesterday. 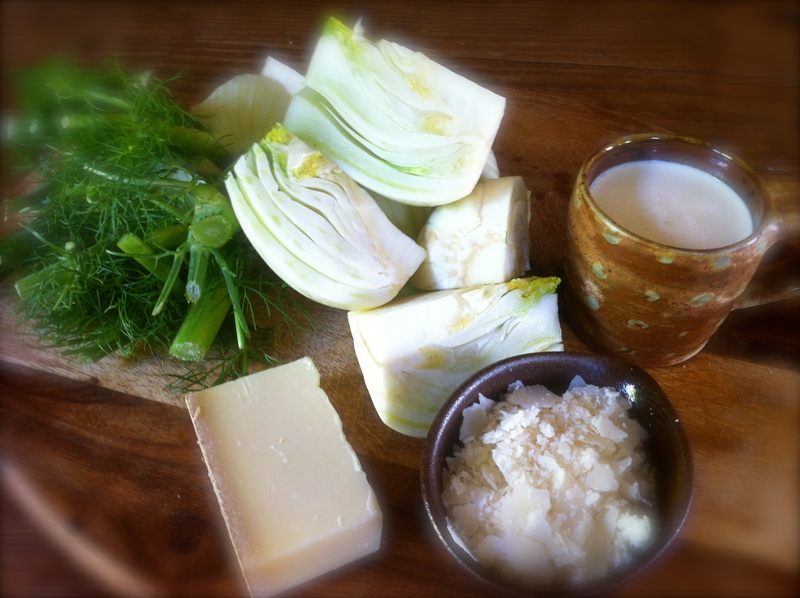 Turned out to be a perfect day to grill indoors and perhaps make a fennel and gruyére gratin. This was the first time I cooked lamb and it was delicious. I always thought in order to have succulent lamb it needed to be braised for hours in a stew. We used the most simplest stove top grilling technique and we were pleasantly surprised how well it turned out. I wonder how many other cooking misconceptions I have! The fennel gratin was a perfect accompaniment to this dinner. Unlike a potato gratin the fennel is light and the gruyére gave it a comforting element needed for a cool rainy day. Served with a minted pea mash and a fennel gruyère gratin. 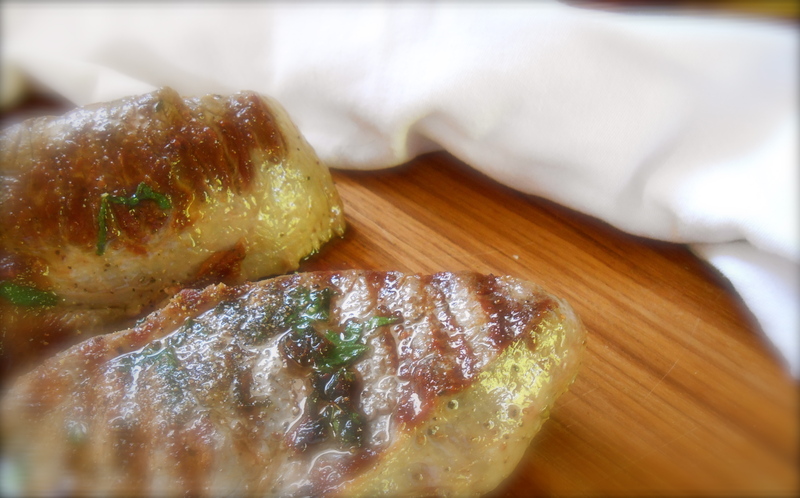 Heat a ridged grill pan and brush both sides of lamb with olive oil and season with salt and pepper. Cook the cutlets over high heat until browned on both sides. I cooked for 4 minutes each side and they were medium rare. This was suppose to be a mint puree. It turned out a little thicker than I expected and instead of thinning it out I decided to keep the consistency as a mash. Very enjoyable. I seem to have been a little stuck on peas and mint lately in my posting. I just love using what is in season and freshly harvested. Cook the peas in boiling water until tender, then drain. Stir in the butter until it melts. Transfer peas to a blender or food processor. Add the cream, salt and pepper, mint leaves and lemon juice and blend until smooth. Serve warm. Preheat the oven to 400°. Trim the fennel tops and save any feathery fronds for later. Quarter the bulbs and cook in lightly salted boiling water for 5 minutes until tender. Drain well and place the fennel in a buttered gratin dish. Sprinkle the reserved fronds on top. Season with salt and pepper, pour on the cream and sprinkle with cheeses. Bake for 20 minutes. I sprinkled a few uncooked fronds on top after baking. I know…and today is a beautiful day, sun breaks and no rain. Oh well. Have a good day! Beautiful and delectable meal. Yum! Loving your gratin specially. Have never tried it before. What a lovely meal, rainy day or no. Glad you enjoyed your lamb. I have a fennel and potato gratin scheduled to post too. 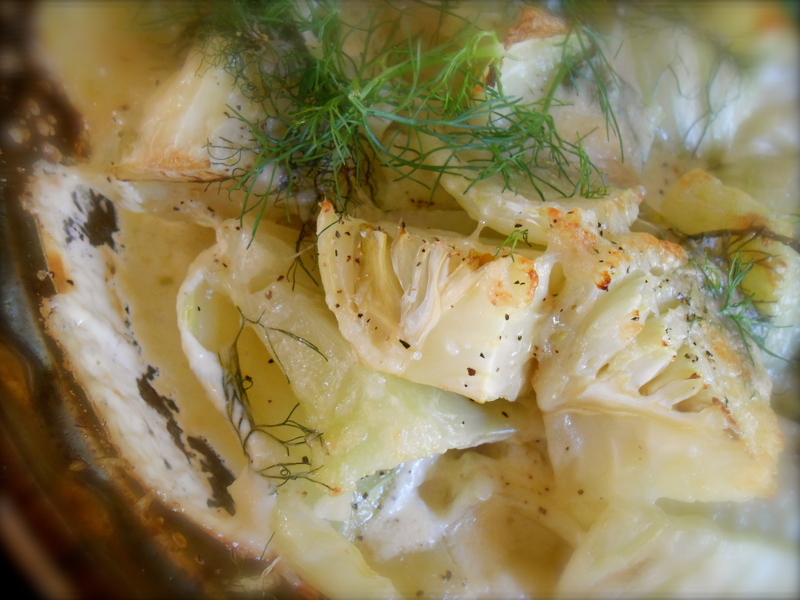 Fennel is so delicious cooked in cream with cheese added, but a rare treat in this house. Love your pea mash, something the English call mushy peas. Your lamb chops and minted pea mash are gorgeous. And I bet they go hand in hand with each other as I always love a little mint with my lamb. :) Thanks for sharing. This is such a great combination of ingredients. Mint and lamb is just perfect! I agree. Very nice flavors to combine. Fennel and gruyère, what a good idea! That’s EXACTLY what I’ve been saying. Although when the rain stops – the lawn will be a foot high! Never mind. We get what we get….may as well enjoy! As a lamb person i think i adore your combination…..
My idea of a perfect meal. I had to keep swallowing while reading your post because (as God is my witness!) my mouth kept watering. 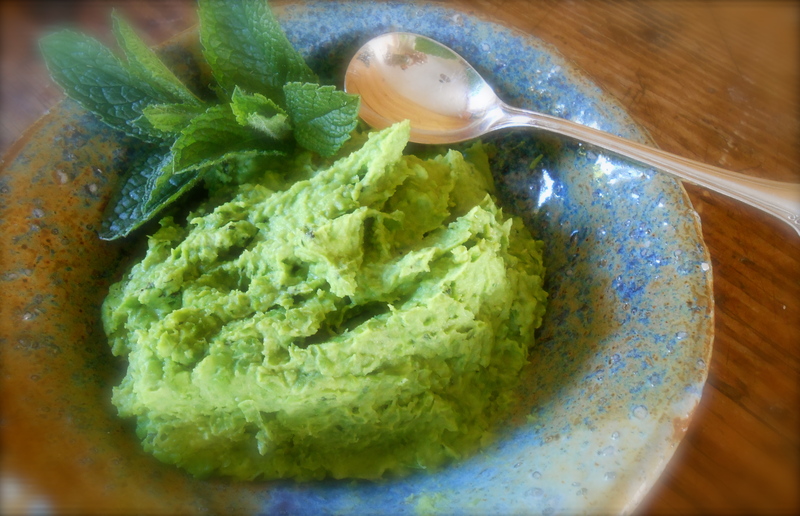 The mint/pea puree sounds lovely. OK, resistance is futile, I HAVE to replicate this meal in its entirely. The combination of peas and mint is delicious and with the lamb, wow, what a delicious meal. Oh wow, that fennel looks amazing! Oh, I just love fennel, and with gruyere added into the mixture, I can just imagine! You know, I love peas but have never had a pea mash. Must definitely give it a try. Beautiful! Thank you Lidia! You must make the fennel gruyere gratin! We loved it. Even my 15 year old son! :) The pea mash was great too…(15 year old didn’t like it so much though) :( He did love the cod! Fennel served anyway works for me, but it is such a great foil for the gruyere, must give the combination a try. Thanks. It really is a must have. I do enjoy a gruyere gratin using potatoes, however I must say this is much lighter and complements the lamb well. This looks so delicious! What a fantastic combination with the lamb and minted pea mash. I’m definitely planning to try your version of gratin :) Thanks lovely! Oh, my. We adore lamb. I have often paired salmon with pea puree but lamb – how did this never occur to me. Very lovely, indeed. You are currently reading lamb chops with minted pea mash at COTTAGE GROVE HOUSE.